Aces and Faults recaps the week in tennis. 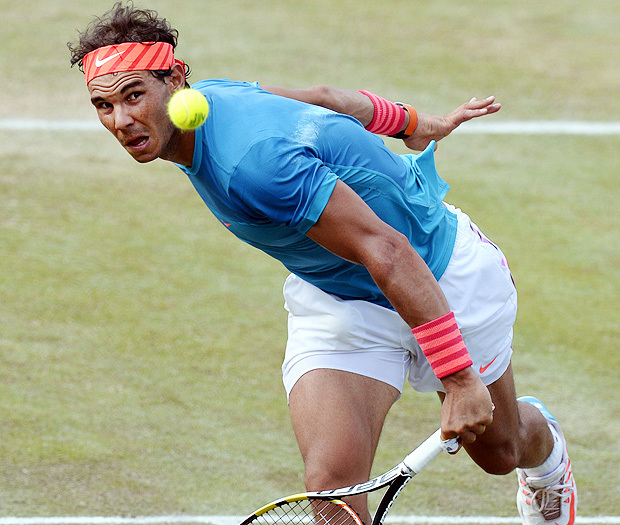 Rafael Nadal got back on track with a win in Germany. Tommy Haas comes back from injury. Eugenie Bouchard struggles. Rafael Nadal: The Spaniard, now ranked No. 10, won his first grass court title in five years, beating Viktor Troicki 7-6, 6-3 to win the Mercedes Cup in Stuttgart, Germany. It wasn't an easy week of work for Nadal. He came through two three-set wins over Marcos Baghdatis (7-6, 6-7, 6-2) and Bernard Tomic (6-4, 6-7, 6-3) in his first two matches, before beating Gael Monfils and Troicki in straight sets to win his second title of the season and 66th overall. "Since 2011 I didn't play a final on grass, so [to] win a title here is very good news for my game and for my mentality too," Nadal said. With his ranking at its lowest in over a decade, in large part due to an injury-marred 2014 season, Nadal has just 370 points to defend for the rest of the year. He'll be back up to where he belongs before we know it. Camila Giorgi: Finally. Playing in her fourth WTA final, the big-hitting Italian came through to beat Belinda Bencic 7-5, 6-3 to win the Topshelf Open in s'Hertogenbosch, Netherlands. One of the most talented, albeit, erratic, women in the Top 50 without a title, Giorgi saved three match points earlier in the week when she beat Yaroslava Shvedova 4-6, 6-3, 7-6 (9) in the quarterfinals. ​Ana Konjuh: The 17-year-old Croat won her first WTA title at the Aegon Open in Nottingham, England, to become the youngest woman to win a title since Tamira Paszek in 2006. A former junior No. 1, Konjuh dropped just one set during her soggy week in Nottingham, which included a double-day on Sunday which saw her win both her quarterfinal and semifinal to set up a Monday final against the crafty Monica Niculescu. After losing her only set of the tournament, Konjuh rallied to beat Niculescu, 1-6, 6-4, 6-2. Despite still playing under age-restriction rules, which limit the number of WTA tournaments she can play until she turns 18, Konjuh is already knocking on the door of the Top 50. Nicolas Mahut: The marathon man just loves the grass. The Frenchman came through as a qualifier to win his third ATP title–all on grass—beating No. 2 seed David Goffin 7-6, 6-1 to win the Topshelf Open. Mahut lost just one set in main draw play all week, defeating defending champion Roberto Bautista Agut in the second round. The win moves him up over 30 spots to No. 60. Belinda Bencic: Just two years since winning the junior title at Wimbledon, Bencic made her first WTA grass final. Her junior rival Konjuh beat her to the punch in winning her first WTA title this week, but 19-year-old Bencic had a strong week in the Netherlands. Seeded No. 4, Bencic saved three match points in a tough win over No. 7 Kristina Mladenovic in the quarterfinals and then rolled past Jelena Jankovic 6-3, 6-3. ​Viktor Troicki: The Serb started out the season like a man on a mission, which he was. Having completed his 12-month ban for a doping violation, Troicki did the hard work on the ATP Challenger Circuit to get his ranking up from No. 847 at the start of his comeback to inside the Top 50 earlier this season. Since winning the Sydney International in January, Troicki has been relatively quiet on the results front until making his second final of the season last week in Stuttgart. Eugenie Bouchard: She's now 1-9 in her last 10 matches. In the first round of s'Hertogenbosch she was up 4-0, 0-30 in the final set before losing six consecutive games to lose 6-4, 1-6, 6-4 to Shvedova. Agnieszka Radwanska: Another slumper continues to stall. Like Bouchard, she was the top seed in her field at the Aegon Open and lost 5-7, 6-4, 6-0 to Monica Niculescu. That final set scoreline speaks volumes about Radwanska's mental state these days. - Michaela Krajicek hit 21 aces in her second round loss to Giorgi. - Giorgi became the fourth woman to save match points en route to a WTA title this season. In fact it was a week of match point saves on the WTA circuit. In addition to Giorgi and Bencic's narrow escapes, Lauren Davis saved eight to beat Magda Linette 5-7, 7-6 (13), 6-2, Saschia Vikery saved six to beat Zarina Diyas 4-6, 7-6 (5), 6-1, and Niculescu saved five to beat Olga Govortsova 2-6, 7-5, 7-5. - Asia, Asia, Asia: The WTA's move into Asia continues as the tour announced its 2016 schedule, which includes new tournaments in Kaohsiung, Taiwan (relocated from Pattaya City) and Nanchang, China (relocated from Baku and upgraded to an International-level). There will also be a new International-level tournament in Louisville, Kentucky staged the week before the U.S. Open. Finally, Mallorca will host an International-level grass-court event opposite of Birmingham. - With the Olympics taking place in Rio de Janiero next year from August 6-14, the WTA's Stanford tournament will move up to take place the week after Wimbledon and be followed by the Rogers Cup in Montreal and then the Olympic break. The WTA Tour will resume its hard court season after the Olympics in Cincinnati on August 15. - Potential bracket-buster at Wimbledon: Sam Groth. The big-serving Aussie knocked off Feliciano Lopez and Sergiy Stakhovsky last week in Stuttgart. - A thought for Juan Martin del Potro, who will undergo another left wrist surgery.